Last weekend I attended another Midwest Grand Tournament, my first Buckeye Battles in Delaware, Ohio. I brought the Skaven and a nearly identical list as Blood in the Sun to make preparation and practice easier, and to stay completely familiar with the list between events. The event had special comp where Magic Resistance could be used against any spell, even spells that normally do not allow saves (Dwellers, Pit, 13th). Also, hills blocked line of sight to all but large targets. Also importantly was the "comp" which was not truly comp, but a banding system. This meant the hard armies would only play the hard armies while the soft drew the soft for the first full day. My first opponent of the event was Jason Matley, who beat me for the GLWL League Championship with his Dark Elves. He brought them again, and this time they were fully painted, and I was looking for some revenge. The scenario was very cool, in that there was a screen completely blocking the other side of the board to make army deployment hidden. Also, Scouts were placed after the screen was removed, so I was happy with the advantage of my Scouts seeing exactly where they were going. 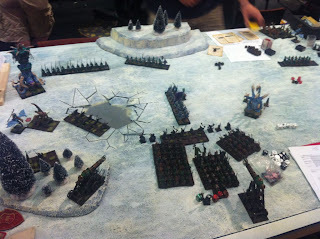 I was happy to have most of my force away from the Hydra and my HPA on the exact opposite side of the flaming Witch Elves to start, and I aimed my Gutter Runners at his smaller and easier to kill units immediatly to get the jump on points. My opponent started first, but I drew first blood after Jason forgot to put the Cauldron ward save onto the Shades. I Plagued them and then shot them with Gutter Runners immediately. The Doomrocket shot true and also took out 13/20 Witches with a long 18" direct hit. My WLC also sniped his second 2+ armor Master that was soon to be aimed directly at my Gutter Runners. This was a big blow to the DE plans. 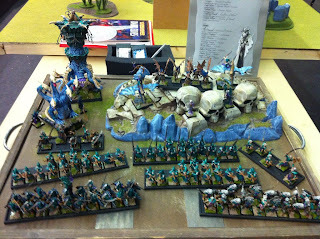 I more or less ignored the Cauldron and went to work trying to pick off units on at a time. In the center the Witches got into the Slaves and chopped them up good, but took a few wounds in return. It was enough that when the Slaves exploded after combat, they also took the last remaining Witches with them. 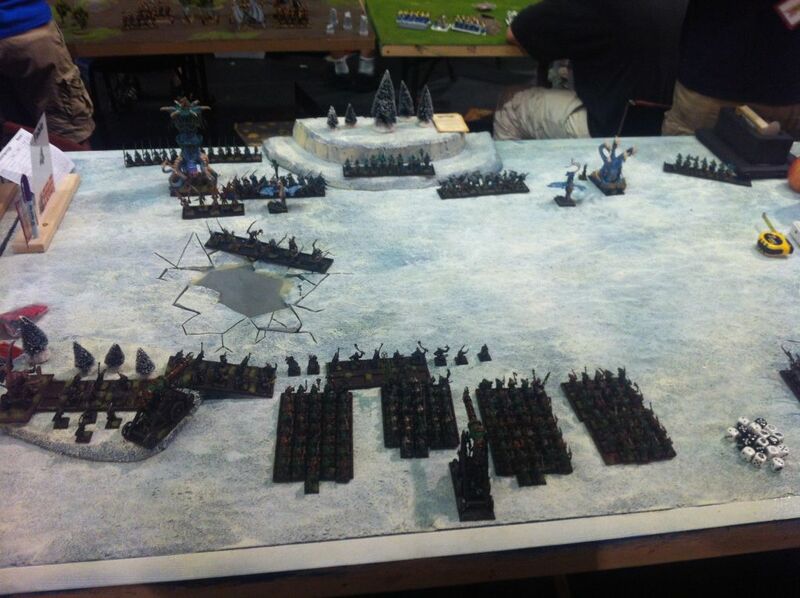 As the Corsairs pushed forward I moved my Doomrocket Warlock up to intercept them but couldn't make it all the way. 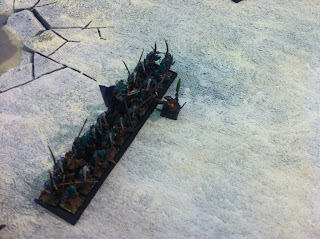 That magic phase I held a few dice to Skitterleap him at the end directly in the path of them, and at an angle so that they would be forced to close the door away from my entire army and then overrun further away. 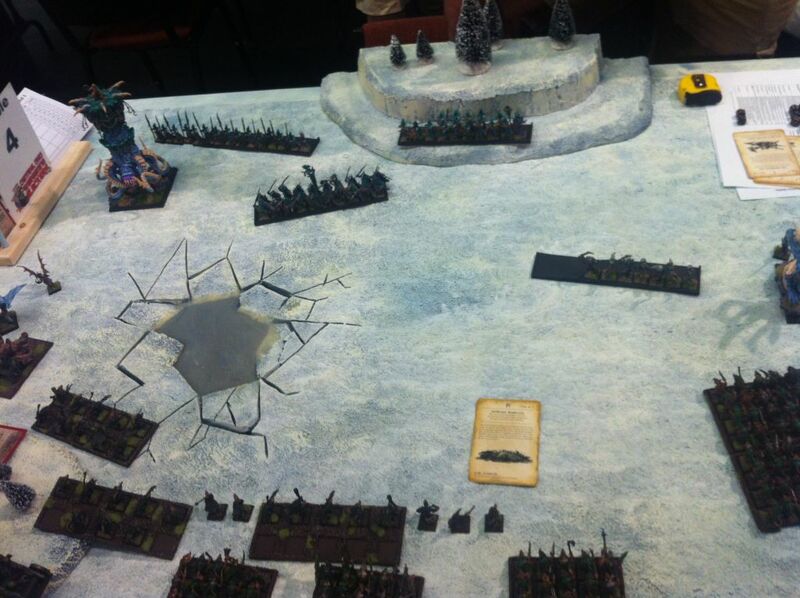 Meanwhile on the opposite flank the Dreadlord with his reverse ward save and 2+ armor was stuck in with the Hellpit. He had been holding the entire game on his Stubborn Leadership but actually did win a round once against the also stubborn DE Lord. He was finally finished off in the end, after putting two wounds on the Lord. The near-miss was when the HPA was dropped to Strength 3, still made it through the 2+ armor (rolled a 1) and the Lord made his save on a 3 to survive. The game ended, and I was sure I had done enough damage to win, but it turned out I needed to win by 250 or more points and I only had won by 230 so got the Draw. The Dreadlord had a wound remaining, and also the Sorcerer that my Gutter Runners got into the last turn but couldn't finish. We only got to play 4 turns because the round seemed to get started late by the TO's and the scenario made deployment take longer which hurt my army... but sometimes you just don't get enough time. So I started off 0-0-1 for Buckeye Battles, and had Ogres to look forward to next! Back tomorrow with the report.